The world’s tallest-growing tree is the coast redwood (Sequoia sempervirens), which grows along the Pacific Coast of the United States, mainly in California. Interestingly enough, it’s not the world’s oldest-growing tree; that award goes to a bristlecone pine (Pinus aristata). Archaeologists have uncovered evidence that grapes were grown to make wine about 8,000 years ago in Mesopotamia (today’s Iraq), although the ancient Egyptians were the first to record the process of making wine about 5,000 years ago. Vanilla flavoring comes from the pod of an orchid, Vanilla planifolia. Though the pods are called vanilla beans, they’re more closely related to corn than green beans. The word pineapple.comes from European explorers who thought the fruit combined the look of a pinecone with flesh like that of an apple. Pineapples are the only edible members of the bromeliad family. From a botanical standpoint, avocados and pumpkins are fruits, not vegetables, because they bear the plants’ seeds. Rhubarb, on the other hand, is a vegetable. Poinsettias, natives of Mexico, were brought to the United States in 1825 by the first U.S. minister to Mexico, Joel Poinsett, for whom the plant is named. The flower of the titan arum (Amorphophallus titanium) is the largest unbranched flower in the world and can reach up to 15 feet tall. The bloom produces a smell like that of rotting meat, giving it the common name of corpse flower. A similar smell comes from Rafflesia, another plant that hails from the rain forests of Sumatra. Both plants developed their scent so they could be pollinated by flies; they don’t compete with other blooms for butterflies and hummingbirds. All parts of the oleander (Nerium oleander), a beautiful Mediterranean-native flowering shrub, are poisonous. Ingesting oleander leaves can cause gastrointestinal, cardiac, and central nervous system problems and possible death. Iris means “rainbow” in Greek, and Iris was goddess of the rainbow in Greek mythology. Wormwood (Artemisia) was named after the goddess Artemis, milkweed (Asclepias) after the god Asclepius, and Hebe after the Greek goddess Hebe. In France, May 1 is La Fete du Muguet, the festival of the lily-of-the-valley. The celebration includes giving bouquets of lily-of-the-valley to loved ones, wishing them health and happiness. 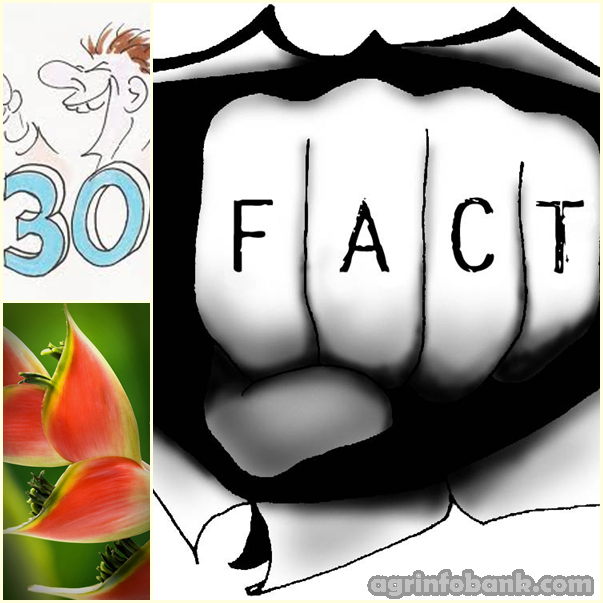 Angiosperm is the scientific name for flowering plants and refers to the seeds being borne in capsules or fruits. Nonflowering plants— pines, spruces, firs, junipers, larches, cycads, and ginkgoes— are called gymnosperms. Snapdragon flowers resemble a dragon, and if you squeeze the sides, the dragon’s mouth will appear to open and close. A sunflower looks like one large flower, but each head is composed of hundreds of tiny flowers called florets, which ripen to become the seeds. This is the case for all plants in the sunflower family, including daisies, yarrow, goldenrod, asters, coreopsis, and bachelor’s buttons. Peaches, Pears, apricots, quinces, strawberries, and apples are members of the rose family. So are ornamental species such as spirea, mountain ash, goatsbeard, and ninebark. Cranberries, Concord grapes, and blueberries are three popular fruits native to North America. The difference between nectarines and peaches is that nectarines don’t have fuzzy skins. You can graft peach branches onto a nectarine tree or nectarine branches onto a peach tree so you have both types of fruits. The average strawberry has 200 seeds. It’s the only fruit that bears its seeds on the outside. Sulfuric compounds are to blame for cut onions bringing tears to your eyes. According to the National Onion Association, chilling the onion and cutting the root end last reduces the problem. Garlic mustard is a member of the mustard family, not garlic. This invasive herb outcompetes native plants in the Eastern and Midwestern United States, posing a threat to other native plants and the species that depend on them. Ginkgo (Ginkgo biloba) is one of the oldest living tree species; it dates back to about 250 million years ago. Dawn redwood (Metasequoia glyptostroboides) is another ancient species; it dates back about 150 million years. Both were known in the fossil record before they were found alive. Peanuts are not nuts, but legumes related to beans and lentils. They have more protein, niacin, folate, and phytosterols than any nut, according to the National Peanut Board. The title for the world’s hottest chili pepper remains contested. ‘Bhut Jolokia’, 401.5 times hotter than bottled hot pepper sauce, earned the Guinness World Records title in 2007, but several hotter chilis claimed the title in 2011. Next Next post: Why GMOs are dangerous?